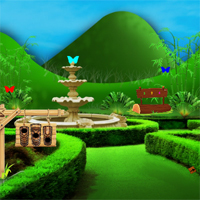 NsrEscapeGames - NEG Nsr Missouri Garden Escape is another point and click escape game developed by Nsr Escape Games. In this game, you are locked into this Missouri garden. You have to find hidden objects to escape from the Missouri garden. Use the clues left in the cave to solve the puzzles. Good luck and have fun! Loaded pretty quickly in Chrome. Keep count of the butterfly colors! aaah, this tune goes right in my ♥...! Jerilynn - which code are you referring to? If it's the green, yellow, pink, the clue is in the far right scene. Click the keys left to right according to the clue. what exactly should happen after clicking colour buttons on gate as per number of counted b'flies?